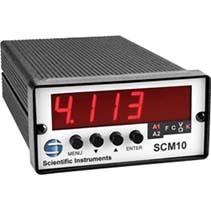 The Scientific Instruments, single-channel Model SCM-10 Temperature Monitor provides the accuracy, resolution, and interface features of a benchtop temperature monitor in an easy to use, easily integrated, compact instrument. With appropriate sensors, the Model SCM-10 measures temperature from 1.4 K to 1,200 K including temperatures in high vacuum and magnetic fields. Alarms, relays, user-configurable analog voltage or current output, and a serial interface are standard features on the SCM-10. It is a good choice for liquefied gas storage and monitoring, cryopump control, cryo-cooler, and materials science applications, and for applications that require greater accuracy than thermocouples allow. 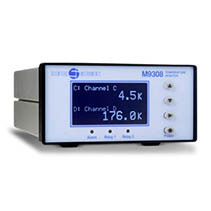 With two or four input channels with ethernet connectivity, these models are the most flexible and accurate temperature monitors currently available. Virtually any cryogenic temperature sensor from any manufacturer can be selected by a single setting of the front panel. 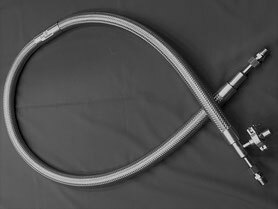 Additional custom or specially calibrated sensors require only a simple setup procedure. In addition to its high accuracy/performance and low noise design, unique features include: Constant voltage AC sensor excitation internal data logging, ethernet connectivity, large easy to read display and extensive utility software.